Your research is not for yourself. It is for your mother, father, brother, sister, cousin, daughter or son. It is for your friends, your colleagues, acquaintances, and even for complete strangers. Your research is for others. It is for those that struggle each day to overcome cancer and other life-threatening diseases. Air Science designs products to enhance the accuracy, efficiency, and repeatability of your scientific research so that you can help others live, thrive, and triumph. Our products feature high quality construction and meet numerous international standards, while incorporating a variety of innovative technologies to help make your job easier and safer. Purair Basic Ductless Fume Hoods - The Purair Basic Series ductless fume hoods are compact, ideal for use in laboratory environments where space is limited or where only small volumes of harmful substances are handled. Purair Advanced Ductless Fume Hoods - The Purair Advanced Series ductless fume hoods are available in 21 standard sizes. This series of high-efficiency fume hoods is designed to protect you and the environment from hazardous vapors generated on the work surface. Purair LF Series, Horizontal Laminar Flow Cabinets - Air Science Purair Horizontal Laminar Flow Cabinets are a series of high-efficiency products designed to protect equipment and other contents of the work zone from particulates. 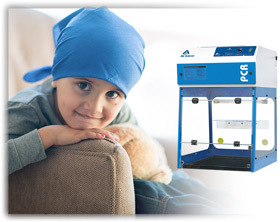 Purair PCR Laminar Flow Cabinets - The Purair PCR workstation offers protection by laminar flow for PCR amplification handlings that are extremely sensitive to contamination with ease of UV decontamination and sterilization cycles. We carry a full line of laboratory products, including ductless fume hoods, laminar flow and PCR Workstations, air filtration products, and replacement carbon filters. Visit the links above or contact us today to learn more.